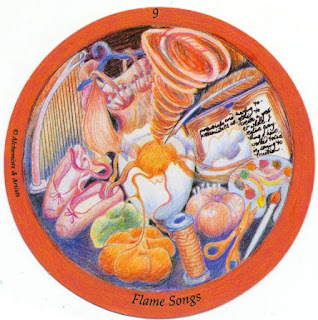 Tarot Bonkers: tarot with a bit of... Science! So while browsing around the internet in search of a bit of a different kind of spread to try out, I came across The Newton Spread on Raven's Tarot Site. I'm not really familiar with the website as a whole, but this spread is the kind of thing that tends to strike my fancy - bit of a different perspective on things, combining tarot with an entirely different field, etc. "Newton's first law of motion (also known as the law of inertia) states that any object in a state of rest or of uniform linear motion tends to remain in such a state unless acted upon by an external force. Card 1 is your inertia, the potential inside you that won't act up or get effective without another force or impulse that will bring it into activity. Card 2 is that other force or impulse that will bring the existing power inside of you into action." What then, within me, is in a state of rest, inert until something pushes it forward, gives it momentum? We have here the 9 of Flame Songs, or Wands per regular titles. A colorful image, cluttered with so many objects united by the theme of creativity and self-expression: dance shoes, crafting supplies, paints and musical instruments and pages full of written words. In the center of it all there is something that looks like a cracked egg, the yolk dripping out, connecting all those objects together, the bright orange energy also flowing out in a tornado above it all. Creative strength, artistic impulses. I've always had them. I used to want to be a writer for a while, as a teen. As a kid art sets were among the most treasured of holiday gifts received. Sometimes I dabble in writing poems. For a while I picked up knitting, then forgot about it again. I used to make collages and graphics on photoshop quite a lot. I go through phases of sketching. I haven't done that in a while, though I do tend to doodle madly, in numerous pen colors, all over what ostensible should be my notes in class; I always have, helps me think and pay attention. When I set my mind to it and found the patience to draw the same thing again and again and again until I got it just right, I managed to design a tattoo which, now that it is on me, I quite love. I once took a ceramics class I quite enjoyed. I go in and out of phases of doing photography. For a while my senior year of college I would destress by drawing/coloring on paper with colored chalk, different entirely and quite fun. Now I impatiently away the silly UPS to actually bring me the watercolor pencils I ordered. Artistic impulses which come and go, which I rarely stick to for long. I allow my attention to flit this way and that, stop doing things for years at a time. Unimportant, unimportant. How many ideas do I have that are never acted on, ideas that flitter around in my mind until eventually they are forgotten because I do not have the time or the energy. There are more important things to focus on, serious things, things related to trying to eventually procure some kind of gainful employment that is not mind-numbingly dull and deeply dissatisfying... and in that context, these artsy things always seem like distractions, like waste of time, self-indulgent and only ok in limited quantities. Enough to destress, enough to distract when thoughts get too overwhelming but then back to the real things, the real. What force or impulse does or could get that creative, artistic side of me moving? 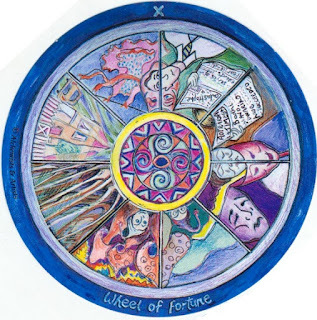 Well, the Wheel of Fortune certainly does represent movement, the world and life spinning in cycles, up and down. 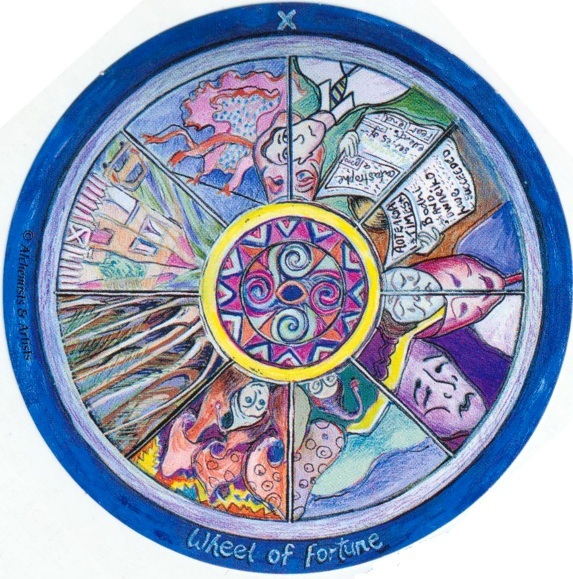 Here the circle is divided into eight slices, each one showing a different image: success and catastrophe, sadness and joy, the bizarre and the mundane. We find ourselves in a variety of different circumstances at various points of our lives. Perhaps this card is suggesting that certain life phases lend themselves much more naturally to artistic endeavors than others. At some points, I was taking art classes and doing artistic projects to fulfill academic requirements. Other times I had so much free time on my hands in made sense to experiment with new things. On the other hand, being a student in grad school, studying Arabic, trying to get life in some kind of order and desperately applying to various internships and suchlike...perhaps not the most conducive. On the other hand, I can also see this as pointing out the fact that life is always topsy-turvy, full of surprises and complications and so many things that must be dealt with. I find time to do other things I consider important in spite of that; hell I find time to do things I know I would be much better of NOT doing - so why not make the time to play around creatively as well? It might not take the same form all the time - perhaps sometimes its more about drawing and other times I have a poem in my head, or a story idea; perhaps right now I have a mad desire to play around with color. Why not? Find time, way, to work on some of those things, to improve my abilities in them. No skill gets better without practice. I can write well, when I try, because I have a hell of a lot of experience in writing. If sometimes I do something artsy and get frustrated because it doesn't come out the way I see it in my head...the only way to get better is to do more of it. I have, despite my creative inclinations, chosen to try to go down a career path where artistic ability is unnecessary, true. That doesn't mean I should engage in it on my own time, for my own enrichment and pleasure. Perhaps more sometimes than others, perhaps in different ways depending on what is convenient or possible but...something to keep in mind, something to pursue rather than ignore, leave un-moved, for that oh so intangible "later". Great spread - thanks for sharing it and your reading!